Kittehz noe haow 2 reech innur serenittee! A couple of books I got a few years ago that are so like this picture. They’re by David Michie. 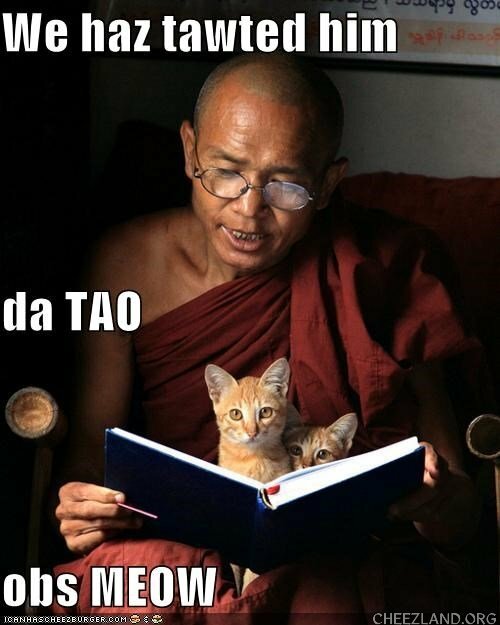 1) “The Dalai Lama’s Cat (2012), 2) “The Art of Purring” (2013). Neither are very big, but easy reading and offer some good insight into cats and sentient beings philosophy. They both made me smile and think very good thoughts. If yu need lessun abowt livin in teh moment an finkin abowt whuts rill importunt, go to kittehs everee tiem.